Description: This animal may reach 9�mm in length. Dense dark brown pigment spots on the mantle are responsible for its dark appearance. The tubercles that cover the dorsal surface are very tiny and conical in shape. The transparent rhinophores and gills are very characteristic. 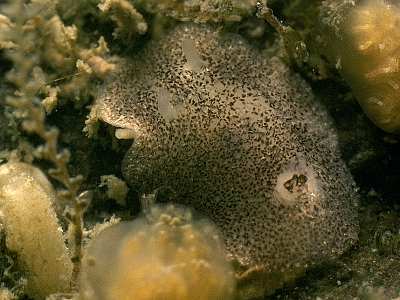 Habitat: O. pusilla feeds on a variety of encrusting bryozoans such as Escharella immersa, Microporella ciliata, Escharoides coccineus, Porella concinna and Oshurkovia littoralis. It has been found beneath shells, stones, rocks and overhangs in areas of strong water movement both intertidally and in shallow water. Distribution: Found all around the coasts of the British Isles, but rarely recorded. Further distribution includes the French and Spanish Atlantic coasts and Norway. Flattened oval body with dense brown or black pigment spots. Picton, B.E. & Morrow, C.C. (2016). Onchidoris pusilla (Alder & Hancock, 1845). [In] Encyclopedia of Marine Life of Britain and Ireland.